Lewis and Clark or early trappers named nearby Belt Butte for its girdle or rocks. 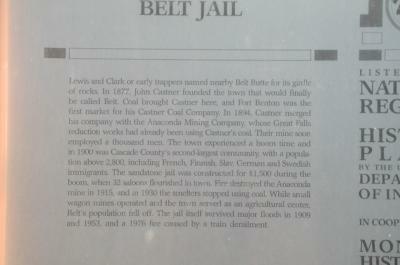 In 1877, John Castner founded the town that would finally be called Belt. 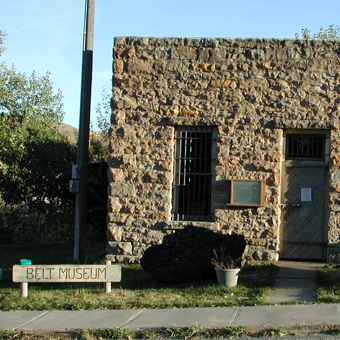 Coal brought Castner here, and Fort Benton was the first market for his Castner Coal Company. In 1894, Castner merged his company with the Anaconda Mining Company, whose Great Falls reduction works had already been using Castner’s coal. Their mine soon employed a thousand men. 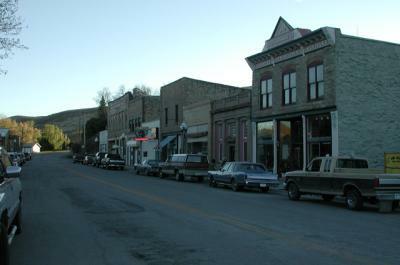 The town experienced a boom time and in 1900 was Cascade County’s second-largest community, with a population above 2,800, including French, Finnish, Slav, German and Swedish immigrants. 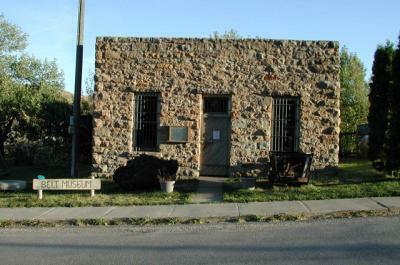 The sandstone jail was constructed for $1,500 during the boom when 32 saloons flourished in town. Fire destroyed the Anaconda mine in 1915, and in 1930 the smelters stopped using coal. While small wagon mines operated and the town served as an agricultural center, Belt’s population fell off. The jail itself survived major floods in 1909 and 1953, and a 1976 fire caused by a train derailment.